1.6 What is calendula officinalis good for? Common English name: Pot Marigold, Inglés Garden Marigold, Garden Marigold, Gold-Bloom, Holligold, Marigold, Marybud. Etymology: The word Calendula derives from the Latin calendas, meaning “first of the month”. It refers to the plant blooms every month, even in winter, when temperatures are not too low. – Catalan: Calendula, gojat, gaujat, boixac, gauget, groguet, jaumet, galdiró, garronada, llevamà, carnation of mort d’Albat flower, mal d’ulls, boixac of jardí, galdirons, goja, pet of frare, lligamà. – German: Ringelblume, Garten-Ringelblume, Ackerringelleume, gemeine Ringelblume. 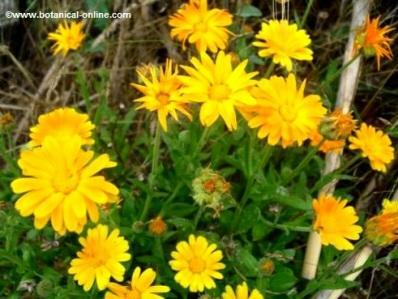 Scientific name: Calendula officinalis L.
Source: The source of the plant is unknown but it lies between the Mediterranean Sea region, Egypt and Southern Europe. It is believed to be the result of natural hybridization among other types of marigolds, probably from Calendula arvensis. Habitat: from 0 to 1,000 m. high, is located in gardens, waste lands, roadsides, near villages. Cultivated as an ornamental gardening. 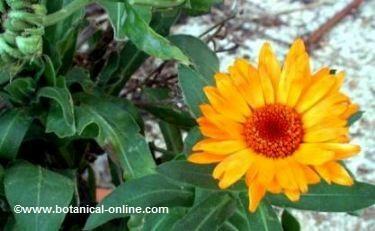 * More information on the Cultivation of calendula. Distribution: Southern Europe, Mediterranean region, North Africa, Western Asia, America. Pot marigold or calendula (Calendula officinalis) is an annual or sometimes biennial plant with erect stems up to 40 – 70cm. tall. It has a deep taproot. The leaves are alternate, petiolate, oblong, spatulate, margins entire or with few teeth, and hairy. Calendula is known for its large flower heads, 5 – 7cm. in diameter. It blooms from June to early November. Marigold flower is an inflorescence. It belongs to the family of Compositae, and, as its name suggests, each flower head is composed of many tiny flowers, yellow or orange, arranged in a chapter or floral disc. Each flower head is a receptacle or involucre where the flowers are arranged. It consists of bracts and rises on a long peduncle or flower stalk. Marigold flowers are radiated, that’s to say, in the middle of the floral heads yellow florets are arranged in the center (male),, and,at the periphery, there are ray florets (female), that look like orange petals. In the illustration with the letter a) states the drawing of a tubulated flower, and with the letter b) a ray floret. Calendula fruit is a thorny curved achene. They have no pappus. The entire plant has a strong unpleasant odor. Pot marigold is a honey plant and its flowers are pollinated by bees, bumblebees, beetles and hoverflies. * View video: Pollination of a flower. Edible plant: flowers and leaves are edible. The young leaves of the plant are eaten in salads and have a flavor that may remind slightly of dandelion leaves.The flower petals are added to salads to decorate and add a touch of flavor. They are also used for flavoring soups, cakes and creamed vegetables. Medicinal Uses: Pot marigold flowers have a recognized medical role for women, as they are used to regulate the menstrual cycle. The flowers also have properties to reduce fever, antispasmodic, for sore throat, for cancer and stomach ulcers. In external use is applied on the skin to reduce swelling, and for its healing properties. Dye: the petals have a yellow dye, used in food and cosmetics, such as food coloring and hair coloring with gold tones. The marigold petals have been used to adulterate saffron. Cosmetics: the flowers are used in skin lotions and added to shampoos to lighten the color of the hair. – The flowers have an ingredient which accelerates bacterial degradation of organic material, thus reducing the time for composting. – The plant repels and reduces the population of some soil nematodes. To predict the time: Calendula flowers close when the weather is humid and it is going to rain, so on certain occasions it has become an indicator of rainy weather. Perfume: The essential oil of Calendula officinalis can be used in perfumery. The analysis of the chemical composition of pot marigold inflorescences described that the plant contains essential oils (from 0.2 to 0.4%), mucilage, salicylic acid, phytosterols, rich in carotenoids, glycosides, flavonoids and tannins. Its components highlights the presence of a bitter principle, calenduline (a triterpene saponin) with antiphlogistic, that’s to say, to treat inflammation. The plant also contains salicylic acid, terpenoids (alpha and beta amyrin), caryophyllene and quercetin, with an analgesic effect. 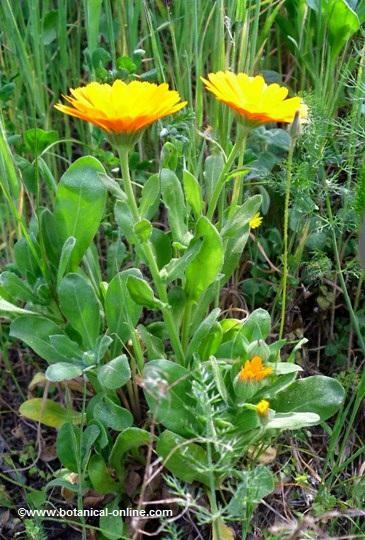 Calendula also contains gentístic acid and malic acid, antibacterial and analgesic effects. 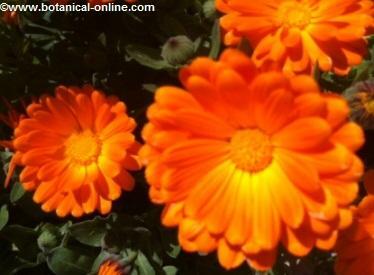 What is calendula officinalis good for? 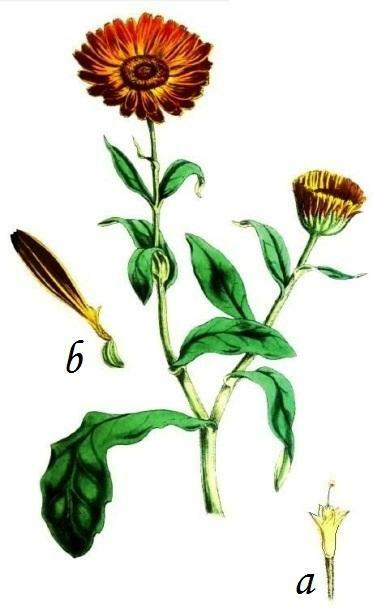 All these components have made calendula in a reputed vulnerary remedy, because the crushed leaves applied to bruises, and flowers to be used internally to treat mouth sores, gingivitis, ulcers and sore throats. Calendula is also effective as a remedy emmenagogue, to regulate the menstrual cycle, because its richness in flavonoids gives it adequate properties to repair blood vessels and restore good circulation in the body. In cosmetics, the marigold is used for skin care due to its bactericidal properties and because of the softening values for the skin. Saponins (25%): calendulosides A, D, F, D2; oleanolic acid derivatives. Terpenoids and triterpene alcohols: lupeol, taraxerol, taraxasterol, faradiol, alpha and beta amyrin, arnadiol. Phytosterols: betasitosterol, campesterol, stigmasterol, cholestanol. Flavonoids: isorhamnetin, quercetin, and rutoside glycosides (isoquercitrin, narcisina, neohesperidósido). Organic acids: caffeic acid, chlorogenic acid, gentístic acid and malic acid. Chinones and polyprenylchinones: heterocyclic aromatic compounds responsible for the strong scent of the plant, qualities that give it antioxidant properties to fight free radicals. It is used in cosmetic creams.